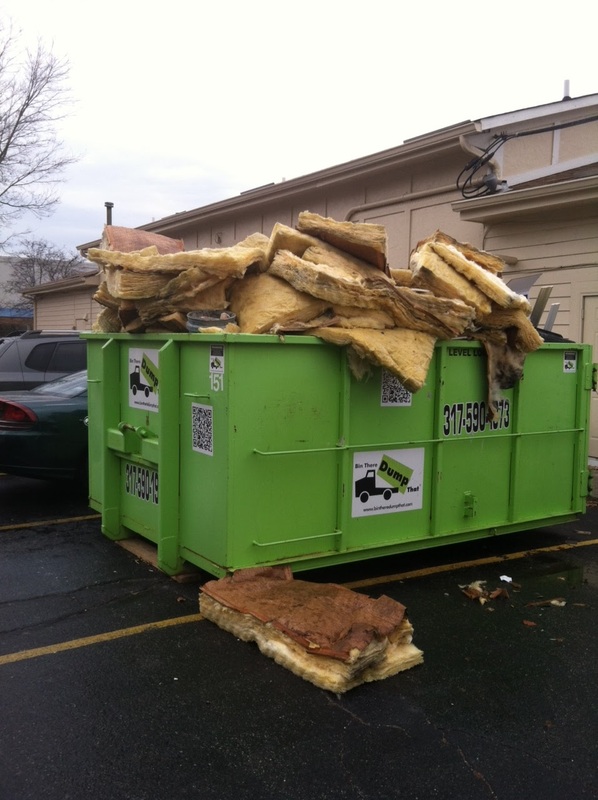 When renting a dumpster one of the key factors to maximizing the space is how to properly load it. Loading a dumpster can be tricky depending on the weight, size and type of material being loaded. Take a look at these three factors when loading a dumpster. which can not be properly secured. First and foremost break any bigger or bulkier items down if possible. Items such as a book case, shelving units and dressers can often times be broken into smaller pieces to maximize space in a dumpster. Secondly load the front of the dumpster first then work your way back. All dumpsters will have one or two rear doors to easily walk in and discard your items. Avoid throwing items in over the top of the bin as its much harder to neatly arrange and make use of the dumpster space. You may want to place any of the larger items near the front of the bin and also any items that may have smaller pieces, which could break off when other items are stacked on them. Finally never fill the dumpster over the top of the unit. When a dumpster is picked up it needs to be securely tarped to ensure the items do not blow away or fall out in transit to the waste facility. All dumpsters are clearly labeled with a sign level load only sign, its vital for your discarded contents safety and those on the road that the dumpster company is able to secure the load properly. When loading a dumpster remember these steps, in the long run it may not only save you time but also money! If your in the greater Indianapolis area and need a dumpster for a residential or commercial project give us a call at 317-590-1973, we will be more than happy to accommodate your needs! We are often asked what is our service area for delivering dumpsters in the greater Indianapolis area. This is a great question as we have a very large service footprint, which covers a radius of an hour or so around the Indianapolis metro area. Whether you are in Carmel, Greenwood, Brownsburg, Lawrence, Lebanon or Westfield we have you covered and that’s only a small portion of the cities we deliver our clean and green dumpsters to! With the added benefit of same day delivery for our valued customers we strive to leave no commercial or residential client with out the opportunity to utilize our dumpster service. Whether it’s a small remodel or a large clean out we have the perfect size bin to help you out in any of the Indiana cities listed above. Give the #1 rated dumpster provider in Indianapolis a call the next time your in need of a clean and green bin, 317-590-1973! Is it Time to Park the Dump Trailer? See why this Indianapolis contractor parked his dump trailer and now uses the clean and green Bin There Dump That dumpsters for all his junk removal and construction waste needs. Having added up all these cost, not to mention having to pay an employee to drive the trailer to the waste facility, pay the disposal fees and losing man hours on the job site the choice is simple to let the professionals at Bin There Dump That Indianapolis handle your junk removal and waste management needs. Contractors if you need to park your dump trailer, we invite you to learn more about the benefits of using our clean and green dumpsters! Click here to let us help! Commercial Dumpster Project in Your Future? 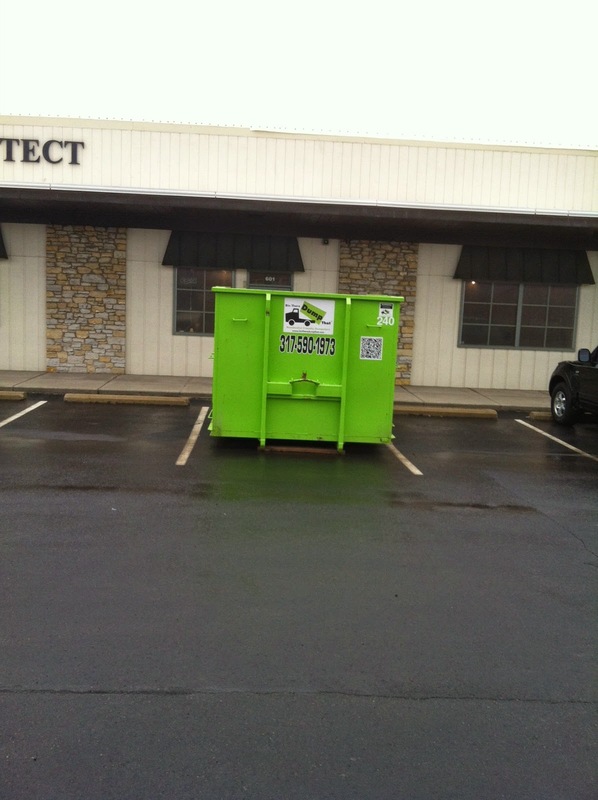 Are you an Indianapolis area contractor who needs a dumpster for a commercial project? Are you tired of waiting on a commercial dumpster when they don’t show up as scheduled? Do you need same day professional service with a friendly smile? 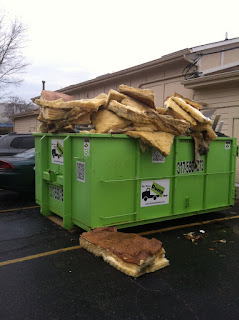 Don’t want an old rusty dumpster on your clients property? Then your search is over, let your friends at Bin There Dump That – Indianapolis take care of your dumpster needs with their always clean and green bins! Renting a commercial dumpster can be a challenge especially for contractors who want a clean and tidy jobsite! Take the worry out of your decision and let us help with one of our 6 convenient dumpster sizes! As a family owned and operated business we recognize the needs of our commercial clients. Fast, friendly and affordable service! See why we have become the #1 choice of contractors in the greater Indianapolis area! Whether your doing a remodeling project, replacing a roof, renovating a bathroom or doing landscape and yard work we have the perfect size dumpster and bin to fit your every need and job requirement! Don’t take our word for it, we invite you to take a look at some video testimonials from past and current customers who chose Bin There Dump That Indianapolis for their dumpster needs! Whether it’s our unprecedented driveway protection guarantee, the ability to get into the tightest of spaces or driveway sweep up we always go the extra mile for our contractors! To learn more about becoming a Bin There Dump That – Indianapolis contractor we invite you to fill out this form and take advantage of first class friendly service! Why wait, become part of our every growing Indianapolis contractor team who choose the clean and green bins for their dumpster rental needs!